This is the second in a series of blog posts about Maker Ed’s Open Portfolio Project work during the summer and fall 2014. These posts are also written in conjunction with the Research Briefs being released throughout the fall and winter of 2014. At the World Maker Faire in New York, we had an opportunity to connect with a wide audience of visitors and makers at the Education Stage. As an extension of the work we have been doing at Open Portfolio Project field sites visits, we conducted a similar hands-on interactive workshop. We asked makers to document the making of a small project, using paper strips and pipe cleaners. Building on our experiences facilitating Design Workshops with educators and young makers during site visits to national makerspaces, we offered a diverse range of Do-It-Yourself documentation stations. The documentation stations including a smartphone scanner made of poster-board, a painted egg-carton to stabilize a tablet, a lego tripod and dissected plastic dinosaur figures that were suggested as stands for mobile devices. We hand-crafted these documentation stations based on ideas from other online projects and have been using versions of the stations during field site visits. At the beginning of the workshop, a group of children crowded our colorful table set-up. One boy was particularly drawn to the Lego tripod, tinkering with how to stick a smartphone that was fitted with a Lego back cover to the tripod. Two girls explored three dissected dinosaurs, which had plastic suction cups attached. Walking the plastic figures across the table, they invented stories and animated the characters by inventing simple dialogues. As the plot of the dinosaurs progressively thickened, another boy joined the table, initiating the use of the dinosaurs as documentation station by attaching them to a smartphone. This observation sparked additional thoughts around the affordances that unique documentation tools may bring to storytelling, or vice versa. What happens to documentation when a fictional character augments and mediates the documentation? 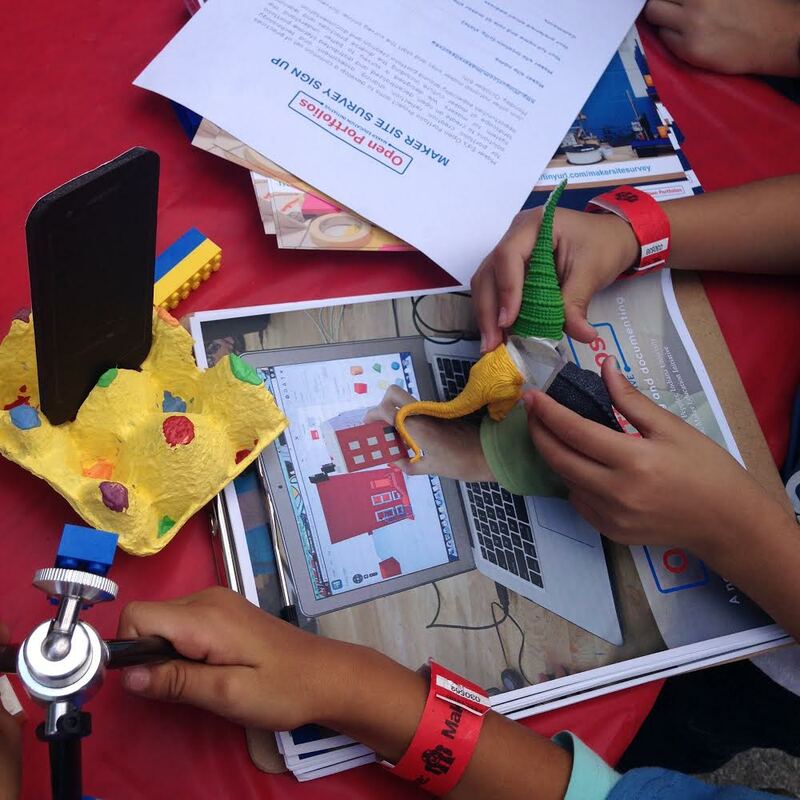 Other participants at our World Maker Faire workshop in New York used the smartphone scanner to create a stop-motion animation with a pipe cleaner object and employed the egg-carton tablet stand to record themselves with their creations. The exploration of DIY documentation stations with adults initiated interesting conversations with maker educators about their current documentation and portfolio practices, including thoughts around how written reflections may be supported through visual imagery, which smartphone and tablet applications could support portfolio creation, and how parents of homeschoolers could be included in the documentation process. Continued interaction with maker educators and youth makers, particularly at World Maker Faire, supported us in deepening our understanding of the tensions that practitioners tackle in relation to maker portfolios. Because World Maker Faire is grand gathering of makers and showcases of their work at a large scale, we had the opportunity to connect more educators, visitors, and makerspaces to the Open Portfolio Project, inviting all to contribute to the Maker Site Survey and join the open portfolios conversation.